I want my home to be clean, but at the same time I don’t really want a cocktail of chemicals in the air that I breathe, or the surfaces that I touch or prepare food on, so I’ve turned to some homemade cleaning products. 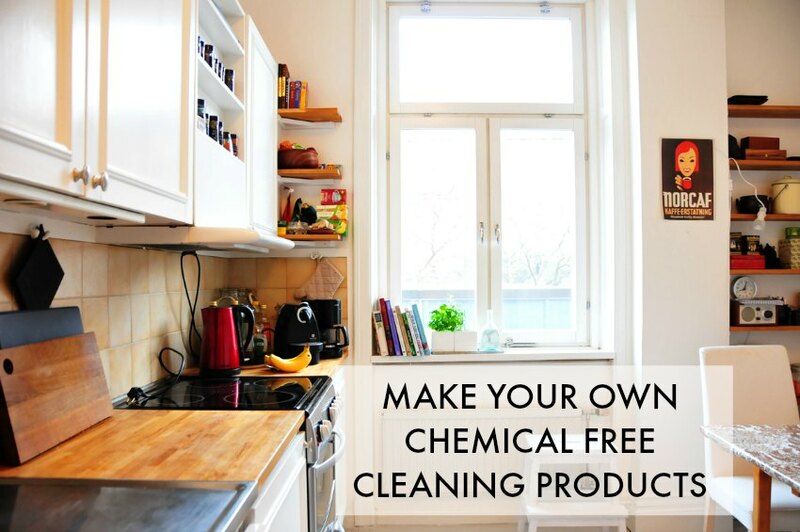 There are all sorts of health and environmental dangers associated with using cleaning products, so over the past few years we’ve been trying to cut down on the amount of harsh chemicals in our home. We first switched to Ecover about six years ago, then Method a couple of years ago, and now we’re using a mix of Ecover (for dishwasher tablets and for toilet cleaner) and BioD products (for laundry, and for hand-washing dishes). 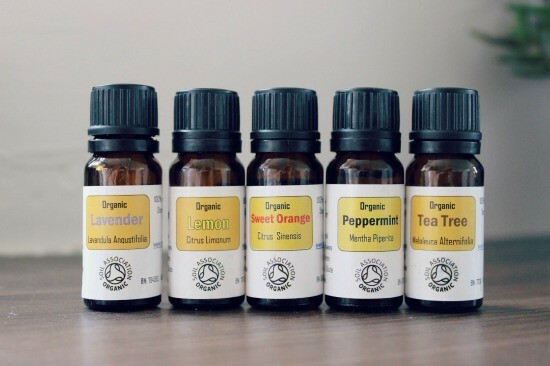 Where we can we’ve also started making our own homemade cleaning products, and I thought it would be useful if I shared my instructions for making these chemical free cleaning products. You can make your own homemade cleaning products quite easily and cheaply, that are as effective as any shop bought chemical cleaner, so I’ve got a host of recipes here for your kitchen and bathroom, and for doing laundry and the dishes. They’ll soon have your house sparkling! I use these organic Soil Association accredited ones to make my homemade cleaning products with. I’ve got lavender, lemon, sweet orange, peppermint and tea tree. As well as smelling great, I like them because as they’re organic I know there are no hidden chemicals in them from the growing process. 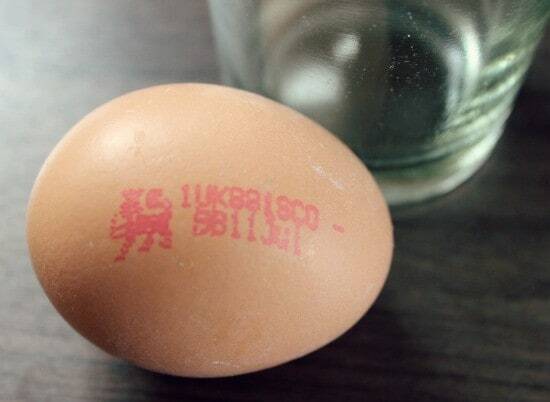 Next, you’ll need a bottle or two of white vinegar. 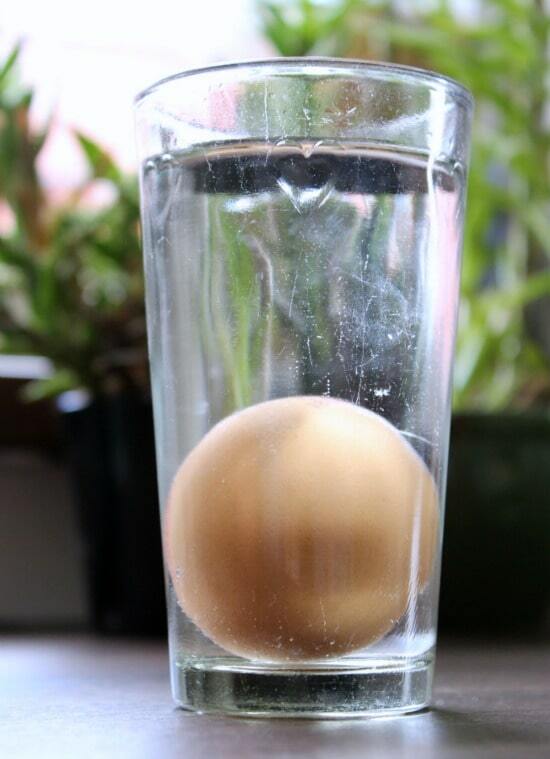 Vinegar is quite a key component in making homemade cleaning products. You can buy white vinegar in the supermarket that you can transfer into a spray bottle, but you can most likely find big bottles of spray vinegar in pound shops. I found mine in Poundland for, you’ve guessed it, £1. 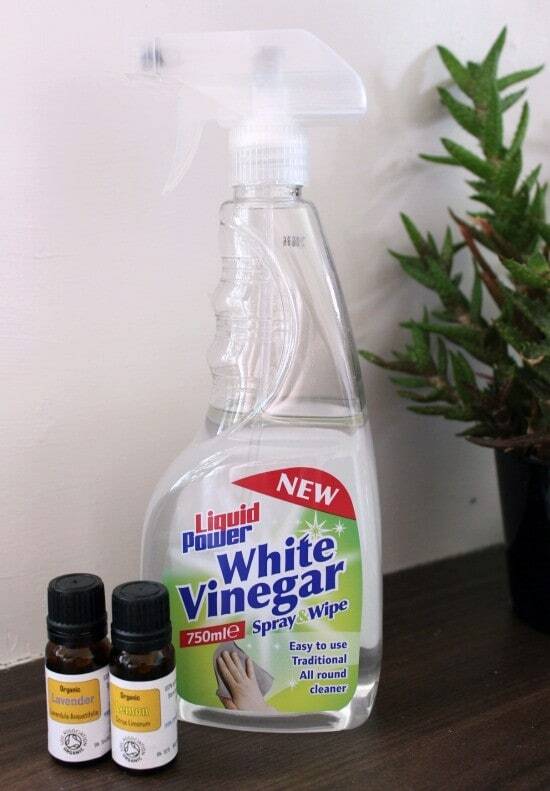 You get 750 ml of vinegar which is much better value than the little bottles you find at the supermarket, and you have the convenience of not having to find an empty spray bottle. 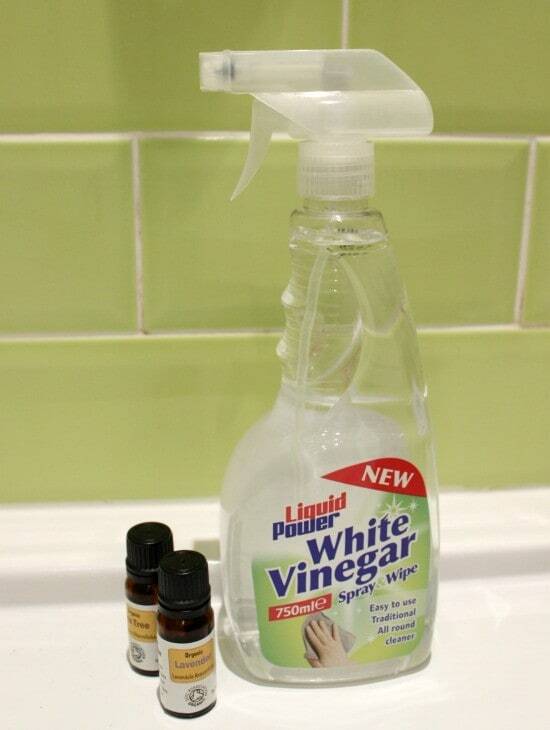 You can also buy white vinegar in bulk, which saves even more money. Sparkling clean, and germ-free without any trace of harsh chemicals! When you use the spray (or any other vinegar based homemade cleaning products) then you do get a smell of vinegar, but that completely disappears once dry, and you’re left with a very light and pleasant scent of the essential oils. If you have any tough spots of grime or dried in food then I find a light sprinkling of bicarbonate of soda, followed by a spray of your vinegar solution and a good rub helps remove the dirt. If it’s particularly dried on or hard to shift try spraying it with a liberal amount of vinegar and leaving it to soak for 10 minutes before wiping. I’ve been spraying it on my tiles after showering to inhibit the growth of mould and remove soap scum, and also using it to wipe down the sink and toilet and everything else. Again, it initially smells of vinegar but when it dries you can’t smell it – only a very subtle aroma of tea tree and lavender. I’ve used vinegar for years as a fabric softener, but I’ve only just started adding essential oils to the vinegar. Simply fill an old jar with vinegar, and add 30 drops of orange oil to your vinegar for softened clothes and a delicate and clean aroma to your laundry, without a hint of vinegar, I promise! With regards to dosage I just fill up to the line on the fabric conditioner drawer of my machine and that seems to work a treat. Do you make any of your own homemade cleaning products? Do share in the comments below! I’m always on the lookout for great tips! 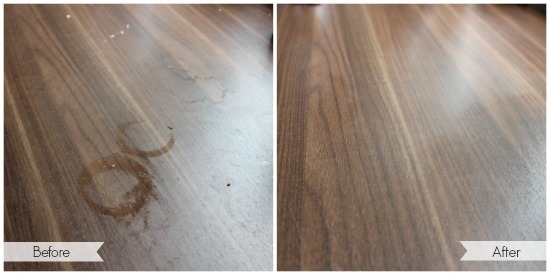 Ps: if you enjoyed this then you might also enjoy my post on green cleaning favourites. I’ve been on quite the green cleaning journey since I wrote this post, and have since shared lots of recipes and methods, that I’ve summarised in my cleaning favourites post. PPS: I’ve been on ever the green cleaning journey since I published this post AND my post on my green cleaning favourites. In 2018 I wrote a book all about green cleaning, called Fresh Clean Home, which is available to purchase now. Do check it out! Main image from here, all others are my own.